This is the most commonly encountered ant in the lower altitude Australian tropical rainforest. This ant is one of only a few species known as 'Weaver Ants' that are found in the tropics of Africa, Asia and Australia. 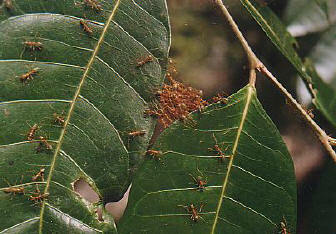 These ants form chains with their bodies to bring leaves together (above), and use silk from their larvae to create their large, football sized leaf nests. These ants vigorously defend this nest, grabbing flesh with the mandible, then bending the abdomen over and squirting formic acid into the wound. This results in a short, but sharp, sting that you may encounter in the region. But you can also bite back as these animals are edible, and quite tasty.